Lewiston. Four New American farmers have found a home at a 30-acre farm in Lewiston, thanks to help from Maine Farmland Trust. New Roots Cooperative Farm is a new enterprise founded by four graduates of Cultivating Community’s New American Sustainable Agriculture Program (NASAP). 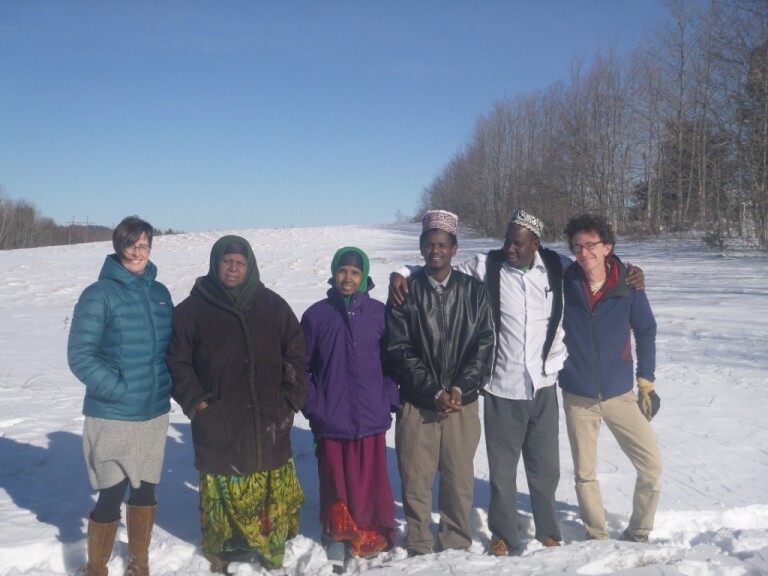 The four farmers are Somali-Bantu refugees, and have been farming in the United States since 2006, at NASAP’s incubator farm in Lisbon Falls. In 2014, Maine Farmland Trust (MFT) was contracted by Cultivating Community to help the graduating farmers find farmland within a 30 mile radius of Lewiston, the farmers’ home. While the hope was to find a landowner that was willing and able to lease farmland to New Roots Cooperative Farm, the most promising prospect that MFT found for the farmers was for sale: a parcel of the former Gendron Dairy Farm in Lewiston. “We were really fortunate to have been able to connect and make a deal with a farmland owner that had a property for sale right within the City of Lewiston, as well as an interest in supporting this growing demographic of Maine farmers,” said project manager Erica Buswell of MFT. MFT purchased the 30-acre farm property on January 22, with a plan to develop an agreement with the New Roots farmers that will allow them to purchase the land at a future date and maintain secure access to the property in the meantime. New Roots Cooperative Farm will work with Land For Good to represent them in negotiating the terms of their agreement with MFT. Concurrent to MFT’s land search process, the farmers have also been working on the development of their business plans, as well as incorporating their farm business as a cooperative with the help of Cooperative Development Institute. New Roots Cooperative Farm will break ground on their new farm this spring. At their new location, the farmers will be able to expand their successful vegetable operations and also begin to try their hand at raising goats and chickens in Maine.